Poll • LDS Church, most state leaders support welcoming people from war-torn nations; plan backers say terrorism has changed the equation. 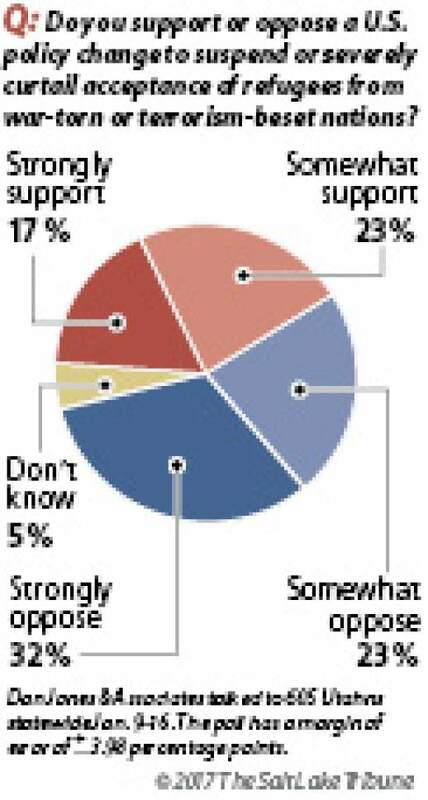 Salt Lake Tribune/Hinckley Institute poll on U.S. refugee policies. 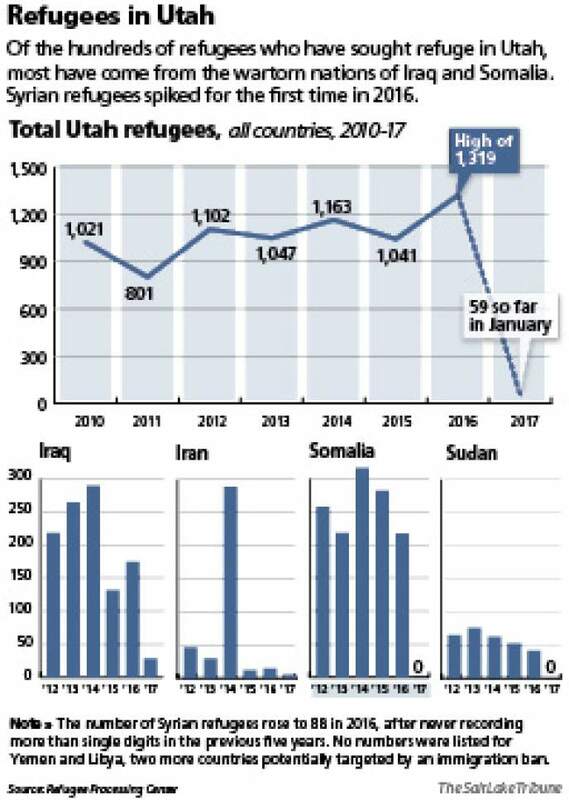 Refugees in Utah Of the hundreds of refugees who have sought refuge in Utah, most have come from the wartorn nations of Iraq and Somalia. Syrian refugees spiked for the first time in 2016. Washington • Most Utahns oppose limiting refugees from war-torn or terrorism-beset nations, a new poll shows, even as President Donald Trump is set to sign an executive order to temporarily suspend any immigration from certain countries. Some 55 percent of registered voters in Utah said they would oppose efforts to suspend or curtail acceptance of immigrants from countries facing terrorism or war while 40 percent said they would back such efforts, according to a Salt Lake Tribune-Hinckley Institute of Politics survey. The split of Utahns on the issue comes as Trump plans to follow through with a campaign promise to tighten vetting of immigrants from primarily Muslim nations, enacting, in part, his promised "Muslim ban." A copy of the draft executive action, obtained by The Washington Post, would order a 30-day ban on immigrant and nonimmigrant entry of travelers from Iraq, Iran, Yemen, Sudan, Libya and Somalia, all of which are Muslim-dominated countries. The ban on admitting refugees from those countries would extend for 120 days and for Syria, indefinitely. The order does not mention religion. "In order to protect Americans, we must ensure that those admitted to this country do not bear hostile attitudes toward our country and its founding principles," the draft order reads, according to The Post. Utah  a state where more than 60 percent of residents are Mormon, whose ancestors faced discrimination and were driven from state to state until settling in the Salt Lake Valley  has long been welcoming to immigrants. More than 60,000 refugees have been settled in the state since 1970, with about 1,200 arriving annually in recent years. One expert said about 60 percent of those who come to Utah are Muslim. Trump&apos;s pending order is likely to be welcomed by his base of followers and derided by immigration advocates. "Refugees are not the enemy. Refugees are not the terrorists, as the new administration is labeling them," said Aden Batar, director of Immigration and Refugee Resettlement for Catholic Community Services of Utah. "These are the victims, the people that have been victimized. They lost their family members. They have been kicked out of their homes. They didn&apos;t have a place to live or even to stay." Batar himself immigrated to the United States in 1994 from Somalia after civil war broke out there, and he lost his 2-year old son. In Utah, he found his calling to help other immigrants and found a community willing to embrace those in need. "Going backward now is going to be really very shameful and un-American," he said. Religious leaders in Utah generally expressed support for refugees. The Church of Jesus Christ of Latter-day Saints issued no new response to Trump&apos;s plan, spokesman Eric Hawkins said Thursday, pointing instead to a statement by Mormon founder Joseph Smith in 1841: "I am just as ready to die in defending the rights of a Presbyterian, a Baptist, or a good man of any denomination; for the same principle which would trample upon the rights of the Latter-day Saints would trample upon the rights of the Roman Catholics, or of any other denomination who may be unpopular and too weak to defend themselves." Other clergy, however, did have reactions to the proposal on restricting refugees  both positive and negative. The National Association of Evangelicals issued a statement urging the president to reconsider what he&apos;s proposing, the Rev. Gregory Johnson said Thursday, but the Utah pastor "stands on the other side." "I&apos;m not as opposed to these restrictions," said Johnson, director of Standing Together, a consortium of evangelical churches in the Beehive State. "I&apos;m far more cautious. I feel it&apos;s appropriate for us to do some serious studying about Middle East countries and be thoughtful about our nation&apos;s security." For his part, Muhammed Mehtar is skeptical about the president&apos;s intent. "We have no issue with limiting individuals [entering the country] based on security concerns, that is the right approach for the country," said Mehtar, imam at the Khadeeja Islamic Center in West Valley City. "But there is a perception that primarily Muslim regions are targeted, and that is a concern not just to Muslims but to human-rights agencies." Utah&apos;s largest mosque attracts worshippers from more than 125 countries, said Mehtar, a U.S. citizen who came originally from South Africa. "Most may not be directly affected but some will. ... [Singling out one group] sends the wrong message to the world. ... Where will it stop?" Several Utah elected officials either passed on commenting on Trump&apos;s expected order  arguing they wanted to wait until they see the official language  or did not respond to requests for comment. Gov. Gary Herbert, who declined to comment until the order was issued, was one of the few Republican governors who didn&apos;t join his colleagues in issuing bans on Syrian refugees in 2015, with his spokesman noting that "Utahns are well known for our compassion for those who are fleeing the violence in their homeland." The Tribune-Hinckley poll shows Utahns would have the back of their leaders if they opposed efforts to halt refugees. But Rep. Chris Stewart, a Utah Republican and member of the House Intelligence Committee, said there is no way to vet some immigrants, like those from Syria, because documents are being forged by groups like the self-described Islamic State group to infiltrate refugee populations. "We probably need to halt refugees from that part of the world," Stewart said. "I would hope that would take six months, not six years." Stewart balked at the Tribune-Hinckley poll question, saying it doesn&apos;t summarize the complex issue. "Philosophically, most Utahns  and I agree with this  we&apos;re a compassionate people," Stewart said. "We want to reach out and help when we can and we philosophically don&apos;t oppose the idea of allowing people from war-torn parts of the world to come and seek refuge here." But, he said, if you inform people that it&apos;s not just about refugees but also terrorists bent on doing harm, they will agree to limiting immigration from certain areas. "You&apos;ve got to understand who is coming here," he said. James McConkie, a lawyer who helped found the Refugee Justice League of Utah to aid immigrants who are targets because of their ethnicity, religion or home nation, said he was surprised there wasn&apos;t a larger number of Utahns who would oppose any curtailing of immigration, citing persecution of early Mormons. "These people are being killed and literally forced out. They don&apos;t have any choice and they have nowhere to go," McConkie said. "You would hope a larger majority of Utahns would be welcoming them with open arms." McConkie blasted the expected order from Trump, noting that it would divide the nation further, inflame hateful rhetoric and hurt deserving refugees. "That type of an order from the president means that he really doesn&apos;t understand the vetting process that is already taking place," McConkie said. "If people are well-informed, they understand there already is kind of an extreme vetting that is taking place." The Tribune-Hinckley poll, conducted by Dan Jones & Associates Jan. 9-16, interviewed 605 registered Utah voters and has a margin of error of plus or minus 3.98 percentage points.  Reporters Peggy Fletcher Stack and Courtney Tanner contributed to this report.